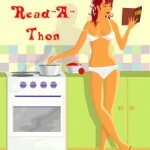 I’ve signed up to participate in a 24-hour-read-a-thon beginning this Saturday, April 10 at 7 am CDT. I will admit from the outset that, as a person with Chronic Fatigue Syndrome, I have no intention/hope of staying up for 24 hours reading. But the website indicates that sleeping is allowed, so I will do my best to read-nap-read-nap, etc. My goal is to work through my huge pile of “currently reading” books and perhaps some of The New Yorker pile as well (have to check the rules on books vs. magazines). Check back here for updates on my progress . . . (the idea is to read & then blog about it).